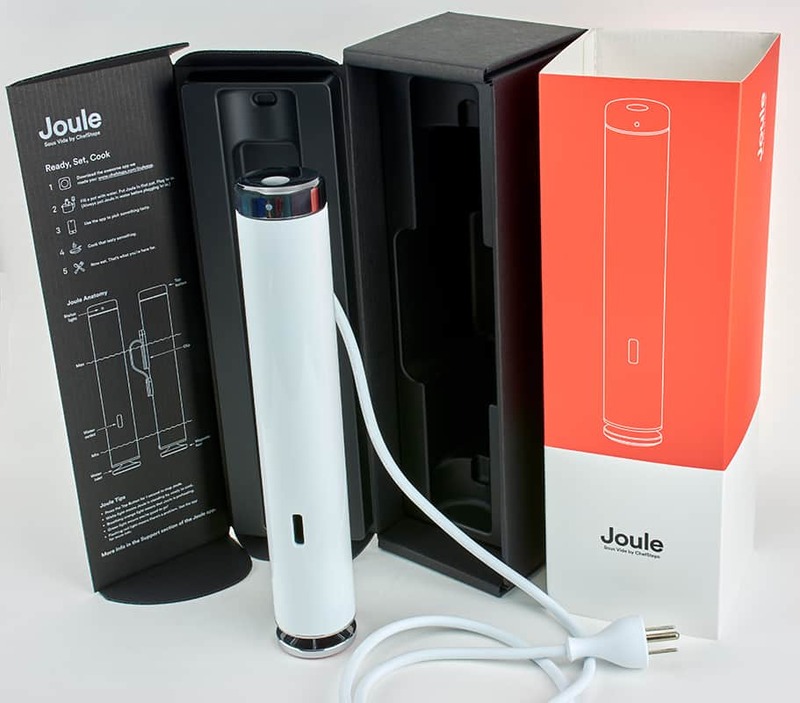 Disclaimer:ChefSteps provided us a free Joule to test for this review. That said, we pride ourselves on providing objective, nonbiased, reviews on everything that we evaluate. Gaining and maintaining your trust is our most important goal. This is a detailed equipment review of the Joule, an immersion circulator manufactured by ChefSteps. They just recently released this WiFi enabled immersion circulator which, when attached to a suitable container, will provide an excellent water bath for sous vide cooking. If you are interested in getting involved with sous vide cooking, especially if you are interested in a circulator with WiFi, this review will give you all of the information you need to determine if the Joule is the right immersion circulator for your needs. The WiFi feature on the Joule can provide several benefits - the most noteworthy are the capabilities to delay the start time of your cook and to provide remote communication with your sous vide circulator. Depending on your lifestyle you may decide that WiFi on your sous vide machine would be a "nice to have" but you don't envision that you would use it often. Or you may determine that WiFi is a "must have" to simplify your life as a sous vide cook. "Built for people who love to cook, Joule is the smallest, most powerful sous vide tool on the market. It's controlled by a groundbreaking smartphone app that includes recipes, tips, and custom features that allow you to visualize and choose your results before you start cooking. Joule will tell you when your food will be done and safely hold it at the right temperature until you're ready to eat." If you're not into details you can go directly to my Joule Immersion Circulator Summary and catch the summary of my analysis. If you are reading this article you may very well be aware of the awesome advantages of cooking sous vide. In that case I would suggest moving on to the next section and begin the review itself. However, we know for those unfamiliar with sous vide that it can initially be an intimidating type of cooking and conceptually its differences with traditional cooking can appear daunting. The various types of sous vide equipment, questions about vacuum sealing, and the science of the safety of sous vide can all play a part in confusing new cooks. If you are new to sous vide, we highly recommend you first read through the Beginners' Guide to Sous Vide which will give you a good introduction to this unique cooking method. When you decide you'd like to discover even more about cooking sous vide we would encourage you to sign up for our FREE in-depth email course, Exploring Sous Vide. And since this is a review of the ChefSteps immersion circulator we can also point you to some additional cooking sous vide introductory content on their website. Now let's get started with the Joule review! The table below lists the basic specifications for the Joule provided by ChefSteps. Please refer to this as necessary as I highlight some of the specifications. I knew from comparing the size and weight specifications of the Joule with other circulators I had tested that it was going to be the smallest and lightest of the group. Even so I was shocked and amazed when I took it out of the box and held it in my hand. This unit is really small and compact. And the fact that it doesn't have a large screen or buttons makes it seem even more nimble. Joule is a tube 1.85" (4.7 cm) in diameter and 11" (28 cm) long and weighs just 1.28 lbs (0.58 kg). The Joule really felt small to me since I typically cook with the Anova One which has a diameter of 2.75" (6.98 cm), a length of 15.5" (39.4 cm) and weighs 4.5 lbs ( 2.04 kg), 3.5 times more than the Joule! For comparisons sake, above is an image of several circulators. From left to right is the Nomiku (weighs 2.75 lbs), Anova One (4.5 lbs), Joule (1.28 lbs) and Anova Precision Cooker WiFi (2.5 lbs). It's one of those things you almost need to "See it (and feel it), to believe it". Similar to all immersion circulators the Joule has a minimum water level, which requires the water in the bath to be above it, and a maximum water level, which requires the water to be below it. Although most people don't pay much attention to the location of these levels, they may have a significant impact on the usability of a circulator. In the case of the Joule, there are several things that are quite unique about these levels. Firstly, the levels are not indicated on the unit itself like other immersion circulators. Therefore you need to sort of estimate where they might be as you fill your water bath and position the Joule. Secondly, the minimum water level is a very shallow 1.5" (3.8 cm). I am not sure how often this feature would be beneficial but it would allow you to cook a relatively flat food item in the minimum amount of water. This could speed up the cook and save energy. With this minimum water level you can actually use a pan that is only about 2" (5.08 cm) deep if it is magnetic. Finally, the distance between the two levels is perhaps the most important parameter. Typically the spacing between these two levels on most circulators is around 3.5" (8.89 cm). In some reviews I have given the circulator a thumbs down because this important parameter was less than the average. In that case it requires the user to be much more attentive to carefully watching the water level during the cooking time and makes some type of lid required for longer cooks. However, in the case of the Joule, I give it a giant thumbs up because it has the largest minimum/maximum spacing of any immersion circulator at 6.5" (16.5 cm), nearly twice the average spacing. This larger spacing is particularly advantageous for the Joule, since it has WiFi, there may be times when you have an extended cook underway and not be anywhere near the kitchen to monitor the water level of the bath. The Joule is unique among circulators in that it has two mechanisms for securing the circulator to the water bath container. The first is a magnetic foot and the second an interchangeable clip system. These will be described in detail in the following two sections. According to the ChefSteps website the Joule has a "Neodymium magnetic mount. Encased within the stainless steel foot is a rare earth magnet that clings with up to 6 pounds of force to cast-iron, steel, and other induction ready pots." This approach is certainly a unique one for securing the circulator to the water bath container. If you happen to have a pot which meets the specified requirements, this magnetic foot is pretty slick. You can just set the Joule on the bottom of the container and it is held securely by the magnetic foot. However, personally I'm not sure how useful this particular approach will be. My skepticism is based on the following observations. I realize that ChefSteps likes to use a metal pot as a water bath container in their videos when their cooking a chicken breast or steak. But I know from my own experience, and I believe for most serious sous viders, we quickly move to a "dedicated" water bath container. This is because we are cooking numerous bags of food and they simply fit better in a larger, rectangular water bath container. Also, we may need the larger stockpot for other uses in the kitchen. Another important advantage to a "dedicated" water bath container is that most have lids with a cut out for the immersion circulator making it easy to cook more efficiently. Because the Joule only works with induction ready pots, unless you have an induction range/cooktop you might not have a metal pot that actual works with the magnet. I know when I got my induction cooktop, I had to replace most of my pots and pans because they weren't induction ready. If you don't already own an acceptable pot, it would be much more economical to purchase a "dedicated" polycarbonate container for your water bath. The Joule uses an interchangeable clip system. The "standard" clip that comes with the unit will fit nearly any pot. The clip works well on my Cambro and Lipavi sous vide containers. 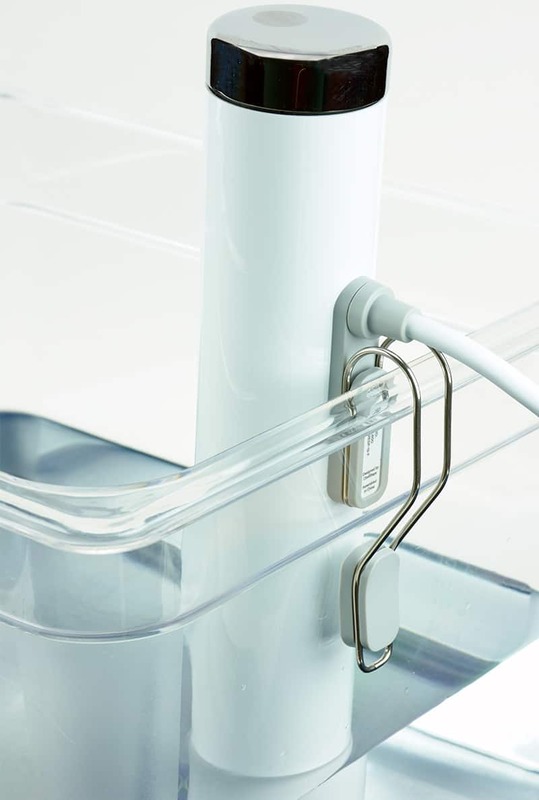 The clip does not open quite as wide as most other circulators which might eliminate using the device on a container with a thick side such as a cooler. In the future, ChefSteps plans to have bigger clips available for purchase for things like coolers. The Joule appears to be reasonably well built and should be durable. The body of the unit is constructed of an extruded impact resistant, food safe polycarbonate. The metal components of Joule are made from surgical-grade stainless steel. Often when considering the purchase of an immersion circulator we don't give much thought to cleaning the unit. 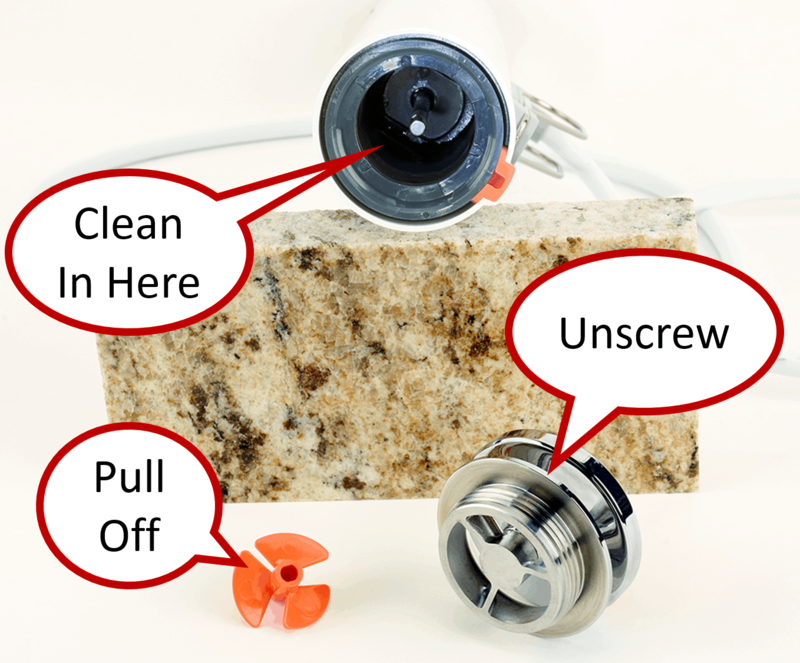 But if you have well water like I do, hard or mineral water, or have experienced a sous vide bag leaking on a long cook, then you know that cleaning can be an important factor in your purchasing decision. The Joule can be cleaned in two different ways. ChefSteps recommends periodically cleaning the Joule in a vinegar bath. This is a relatively quick and straightforward process described in their online documentation. The second way to to take the unit apart. A portion of the inside of the Joule can be cleaned by first removing the magnetic foot by twisting it counterclockwise. Then you can remove the propeller and then use a wet sponge or bottle brush to gently wipe out the inside. When doing this be careful not to damage the soft rubber seals at the top of the heating cavity. For most people this may be a "don't care", however, in my case I appreciate the additional length on this unit. If you can position the water bath and circulator directly in front of an outlet on your countertop the short cord on some units will be adequate. On the other hand, if you have a ways to go to get to an outlet, or as in my case you are using it on an island and need to reach a plug under the countertop, the additional length of this cord is a welcome benefit. How Much Does the Joule Circulator Cost? 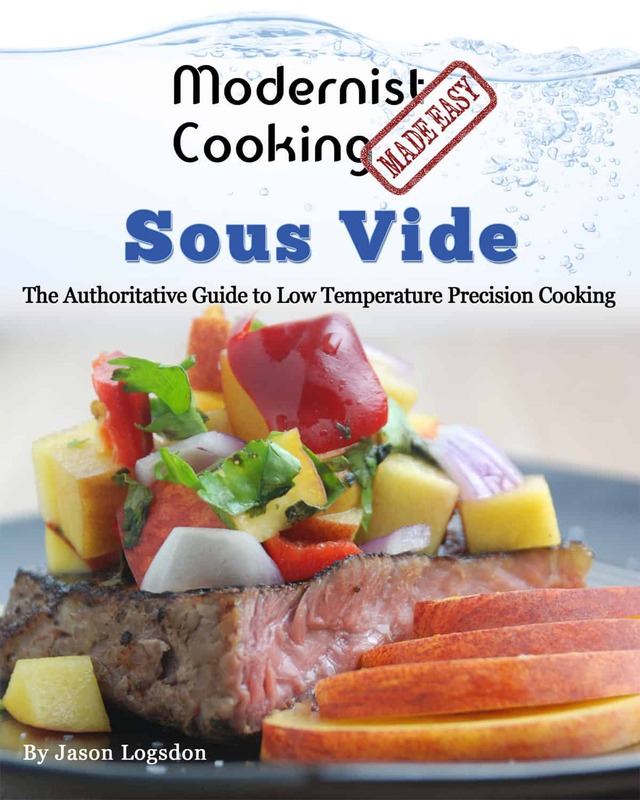 Over the last few years the popularity of sous vide cooking has increased significantly. This is due in large part to the availability of low cost, high quality, immersion circulators. Fortunately for sous vide enthusiasts like us, the competition in this market has really heated up. However, right now there is only one other WiFi enabled immersion circulator available. The Anova Precision Cooker WiFi, is an immersion circulator manufactured by Anova Culinary LLC. This circulator is essentially identical to the original Anova Precision Cooker except the capability to communicate via WiFi has been added. It typically sells for around $200 on Amazon. The Joule is sold on the Amazon website for $199. The primary function of a sous vide water bath is to maintain a precise low temperature during the entire duration of the cooking cycle, which could be minutes or days. There are numerous factors that go into determining how well the Joule performs this function. I will cover those in this section and highlight some of the similarities and differences between the Joule and other immersion circulators. The specifications in the table were gleaned from the ChefSteps website in numerous locations. Please refer to the table below as needed as you read through this section. The Joule has many characteristics which are similar to other immersion circulators. The Joule covers a temperature range which is adequate for all sous vide cooking and the accuracy is comparable with other units. The maximum temperature setting is 208°F (98°C). "In a well-insulated, covered container - a cooler, say - your little Joule can heat up to 10 gallons (40 liters) of water. In a covered pot, it can heat about 5 gallons (20 liters). When you're cooking without a cover, we generally recommend limiting water volume to about 2.5 gallons (10 liters)." Judging from that paragraph, I would assume that the Joule can handle water bath capacities equal to or larger than most other immersion circulators. The pump speed for most operations is 3.6 L/minute, but the Joule adapts its flow rate at high temperatures and reaches a maximum of 6 L/minute. The location of the pump's output, however, is much different in that it's located about 3.5" (8.9 cm) above the foot of the unit. View the pump in action. I am not sure why this design decision was made but I suspect they felt they would get better circulation by separating the pump input and output by a greater distance. The ChefSteps Joule, rated at 1100 Watts, is one of the most powerful immersion circulators. It also uses a somewhat unique method for heating the water. The Joule uses a cylindrical thick-film heater which is extemely efficient. it is also one of the reasons that the Joule is smaller and lighter than other immersion circulators. What Do Others Think of the Joule? Perhaps the greatest downside of the Joule not being sold on Amazon is the lack of real user reviews. The Joule has certainly been reviewed by numerous websites similar to this one and received many accolades. However, that's not quite the same as using the device for several weeks for a variety of different types of sous vide cooks. I believe the unique design of the Joule was mentioned by nearly all reviewers that I've read. 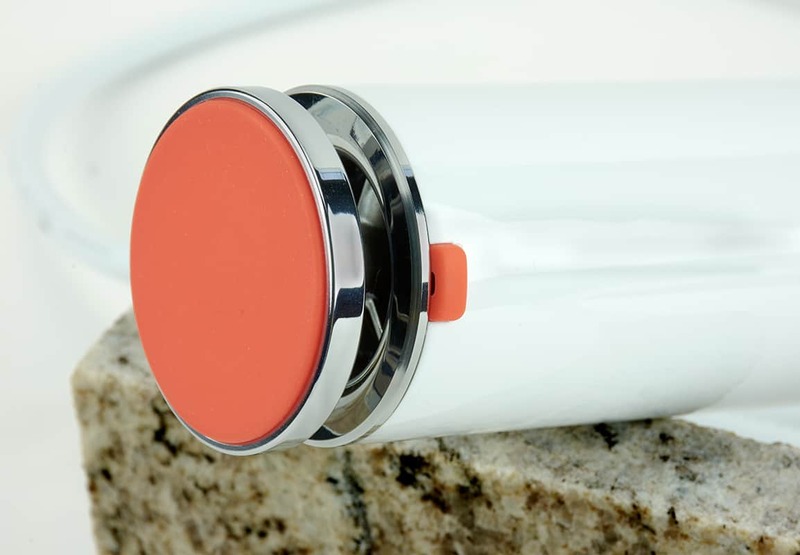 The small size and simplicity of the design, the lack of a "manual" interface, and the magnetic foot has garnered the attention of nearly all reviewers. The quality of the Joule app has also opened the eyes of many reviewers. It is clear that this remarkable app has benefited greatly from the ChefSteps' rich history of teaching cooking. The use of short, high quality, videos makes the app a pleasure to explore and use. The app definitely makes this immersion circulator an ideal one for sous vide beginners. The prior two sections presented the specifications for the ChefSteps Joule. This section will demonstrate what actually happens when the "rubber meets the road". We have created the "Sous Vide Machine Benchmark" that runs the immersion circulator through a series of lifelike scenarios to see how it operates "in the real world". The results of the benchmark are shown in the table above for the ChefSteps Joule. You can learn more about the Sous Vide Machine Benchmark and see how the Joule compares with other sous vide machines we have benchmarked. Even though the Joule is smaller than all the other immersion circulators it is one of the more powerful ones. The Room Temperature Start Time and the Hot Tap Start Time are both quite respectable and in the top 3 times of all inexpensive circulators. For example, it took about 5 minutes to bring the water bath up to 140°F (60°C) if the water was hot from the tap. The temperature variation during the cook was also quite good at about 0.1-0.2°F. The power consumption during the benchmark was one of the lowest tested. This is probably due to the high efficiency of the thick-film heater used in the Joule. The ChefSteps Joule was also one of the quieter immersion circulators as long as the water level was above the pump outlet. When the water level is below the outlet additional noise is created by the pumped water stream splashing into water below. That's why there are two sets of numbers listed, the higher ones are with the water level below the pump outlet. The ChefSteps Joule is the first immersion circulator that has taken the bold step to require a smartphone in order to operate it. One can only conclude from this design decision that ChefSteps felt that the majority of people interested in sous vide cooking would have a smartphone. This could very well be the case. The Joule still essentially has two user interfaces: one on the device itself, albeit a simple one, and the Joule app via WiFi. I will present the user interface on the device itself first and then follow with accessing it via the smartphone app. It is hard to create a user interface that is simpler than the Joule immersion circulator. It is comprised of just two items: a Top Button and a multicolor LED. The Top Button is made of solid 316L stainless steel which will last forever. To turn the Joule on you simply plug it in. To turn it off manually you push down on the Top Button for one second. As output devices go you can't get much simpler than a single multicolor LED. And although the Joule wins the prize for the simplest user interface, it's by far one of the least intuitive. Why? Because they use that single LED to communicate 12 different situations. You need to look at the color (white, orange, green, yellow, blue or red) and how it's being displayed (solid, blinking, slowly blinking, or double blinking). Once you determine that you can look on the ChefSteps website to decode what it is that the Joule is trying to tell you. And please keep in mind that the app will be communicating this information to you in a much more user-friendly way. The greatest differentiator for the Joule is its connectivity to a smartphone app via WiFi. This allows the user to control and monitor a sous vide cook from a remote location. At the time of this review it is the second immersion circulator available with this unique capability. Since the performance of the smartphone apps will change rapidly over time I will make the summary of my experience with the Joule WiFi app relatively brief. I have been working with the iPhone App Version: 2.371. The apps for immersion circulators today typically handle two broad functions. The first, and most important, is to be able to control the immersion circulator remotely via Bluetooth and/or WiFi. The second is to provide some amount of valuable sous vide cooking content to assist the cook. These will be addressed in the following two sections. Then I will share with you the capabilities I feel the Joule app is currently missing. The ChefSteps Joule is unique in that the only way to control the immersion circulator is via the WiFi app. The Joule app provides two alternative ways you can start a sous vide cook. The first is to take advantage of the "intelligence" built into the app to calculate the proper time and temperature for the specific food or recipe you are going to cook. This method is really advantageous for cooks that are new to sous vide since it leads you by the hand to a perfectly cooked result. I will cover this method in a little more detail in the section on assisting the sous vide cook. The second alternative for controlling the Joule is more of a "manual" method and is ideal if you already know the time and temperature you would like to use for your sous vide cook. You begin by clipping the Joule to the side of your water bath container, or if you have a magnetic pan, simply standing it up in the pot with the magnetic foot attached to the base. Then fill it with water so that it's between the Max and Min levels on the unit. Next, plug the unit into a three-pronged outlet and the LED comes on in a solid white color (Actually it looks more like a very pale pink to me). Assuming you have already linked your smartphone to the Joule, you then just open the app to the home page and the app will walk you through the startup process. It's easy to start the Joule manually by following the sequence shown in the screenshots above (moving left to right). You press the red start button in the lower right-hand corner of the home page and it takes you to the screen to set the temperature. You plug in the temperature you desire and then press the red start button again. The next screen will show you in the orange circle both the current temperature, in large characters, and the target temperature, in smaller characters above it. The shading in the circle indicates how close you are to reaching your target temperature. Once the target temperature is reached the app will send a notification and display the screen that indicates, "Your water is heated!" You can then dismiss this notification by pressing the "Okay" button. If you would like to set the timer, you can follow the sequence shown above. It begins by pressing the smaller orange circle on the screen immediately above the text, "Set a timer." The bright orange screen appears and you can punch in the desired duration of your cook. Then just press the orange START button in the lower right of the screen. The time is then displayed and counts down throughout the cooking cycle. Once time expires you get a notification telling you the food is ready. You can then dismiss the notification, but you will notice now that the screen says the timer is up. Even though the time has expired the Joule continues to run. The Joule can be stopped at any time using the app by pressing the black power "button" in the lower right-hand side of the screen. As mentioned earlier, it can also be stop by holding down the Top Button on the device itself for one second. In addition to allowing the user to monitor and control the immersion circulator, the ChefSteps Joule app also provides valuable information to assist the user in cooking sous vide. This is the area where the Joule app really shines! It provides a good quantity of information and it does it in a way that far surpasses any other apps that I've seen. Many of the companies that brought immersion circulators to the home market were instrumentation and appliance manufacturers; e.g. Anova, PolyScience, and Gourmia. Others are companies that were created, typically through crowdfunding, to design and build the circulator; Nomiku and Sansaire. The point being that the primary focus of these companies was in the design and manufacture of the immersion circulator itself. By contrast, since its inception in 2012, ChefSteps has been dedicated to helping people cook smarter. The team there is made up of chefs, scientists, photographers, writers and engineers who are dedicated to helping you cook confidently. Their website is a remarkable resource of recipes and cooking tutorials. These cover a wide variety of different types of food, but the content focused on sous vide cooking is exceptional. ChefSteps has leverage their expertise in teaching people how to cook to create a sous vide app for the Joule which is truly a joy to interact with. The app contains both recipes and cooking guides to make cooking sous vide simple. The vast majority of the content is provided in short high-definition videos which make it easy to understand the steps being explained. There is a somewhat limited number of recipes, but each makes it easy to determine the time and temperature for the particular type of food you are cooking. The app will then transfer the time and temperature information to the Joule so that you can begin cooking. The assistance provided by the software in the app definitely makes the ChefSteps Joule an ideal choice for the beginner sous vider. Perhaps the coolest feature of the app is what they call "Visual Doneness". For example, they show a video of what it would be like cutting a steak that's cooked to a variety of different temperatures. That way you can pick the one that looks the best to you. I could easily spend several more paragraphs describing how the app works but I could never do it justice. I would suggest you go to your app provider and download the app to your smartphone and give it a drive. I know on iTunes they welcome sous viders with equipment from other manufacturers to download the app for their use as well. Arguably the greatest benefit of having a WiFi enabled sous vide machine is the ability to delay the start time of a sous vide cook. This benefit comes into play when you are cooking a meal sous vide but are going to be away from your kitchen for longer than the meal's cook time. Delaying the start time prevents you from overcooking the food while still ensuring the food will be fully cooked by the time you return. Unfortunately, at the time of this writing the Joule app has no support for this important benefit. I hope sometime in the near future they will add that capability. The one nice thing about the Joule unit itself is that you can download new firmware into the unit via the WiFi. This obviously has the advantage of being able to make the unit itself smarter if necessary in order to support future capabilities. I don't know of any other immersion circulators that have this firmware download capability. Overall my experience with the user interface of the ChefSteps Joule has been quite positive. It is very intuitive to use and it has been relatively reliable. The content in the app designed to assist the sous vide cook is truly extraordinary. However, the capability to monitor and control the unit is currently bare-bones. Many of the useful things you could do with a WiFi immersion circulator are currently not supported in the software. However, I do have a high degree of confidence those capabilities will be added in the future. The factors I have discussed thus far have been primarily objective in nature. However, there are a few factors that are more subjective. I will present my view of them in this section. Since they are subjective by nature you may totally disagree with my assessment - which is fine. But these are at least factors you may want to consider as part of your purchasing decision. The Joule immersion circulator is a classic example of minimalist style. It has ultra clean lines with the simplest possible input and output controls. The Joule is small enough to easily go in a drawer, but if you would like to leave it out it would complement any style of kitchen you might have. Arguably the most exciting aspect of the ChefSteps Joule is the inclusion of so many new and different design elements. I don't know that every one of them is an improvement over the more traditional approach, but I applaud ChefSteps for being willing to break new ground on the design of their immersion circulator. I will highlight the design elements I found most intriguing. Clearly the choice to only provide control to the device through the app is the greatest departure from the status quo. Although I really love the reduced size and weight of the Joule, I am still not quite sure if I am a fan of this design decision. Perhaps it's just because it is foreign to me, and it will grow on me over time. I'm sure many will love it. As an engineer, my concern is based on my understanding of all the things needed to go "right" in order for the app to consistently monitor and control the immersion circulator. Perhaps a stronger way of saying it is I know many of the things that can go wrong in the communication chain. To name just a few: power goes out briefly to the immersion circulator, the WiFi in your house and/or where your smartphone is gets interrupted, or the software in the unit or your app has a bug in. While it is true some of these could cause an immersion circulator with built in control to also fail, the probability of a failure is just higher the longer and more complex the communication path is. The seamless housing is extruded from impact resistant, food safe polycarbonate that's easily wiped clean. This is accented by high quality stainless steel positioned at both ends. The Joule looks and feels like a well-designed and well-built kitchen appliance. Overall it was quite easy to set up, cook with, and store afterwards. The Joule is the only immersion circulator completely sealed against accidental water intrusion. Hopefully I will never have to test this out by accidentally dropping the unit into the water bath, but it's good to know the typical steam issues will also be handled because of this design advantage. With most immersion circulators that I am familiar with the water is drawn in relatively low and pumped out very near the bottom of the circulator. The Joule brings water in the bottom and pumps it out the slot in the front of the circulator approximately 3.5" (8.9 cm) above the magnetic foot. I suspect this was done in order to improve the way the water circulates in the bath. I have no way of knowing whether it improves the circulation or not. As long as the water level in the bath is above the slot the Joule operates pretty much like a traditional immersion circulator. However, if you choose to run with a lower amount of water then the water being pumped out of the slot can create a couple minor issues. First, it makes the unit run considerably louder because of the water landing in the bath. Also the constant sound of this water tinkling down may encourage you to do likewise! Depending on the overall depth of the water bath container, it is possible for some of the water to splash out during the cook. If you happen to like to use an induction ready stockpot as your water bath container, this magnetic foot can be an important benefit. I'm just not sure how much it will benefit the majority of sous viders. The Joule has also taken a different approach to the way they heat the water. They employ a cylindrical thick-film heater which is quite efficient at heating the water. It also contributes to the light weight and size of the unit. There is a small feature included on the Joule that I've not seen any reviewer, or even ChefSteps marketing literature, mention. Yet I believe it speaks volumes about how much time, effort, and passion went into the design of the Joule immersion circulator. It is the small orange piece of rubber-like material located near the base of the unit, and on the same side as the clip (see image above). I assume the purpose of this small bumper is to prevent both the water bath container and the Joule unit from being scratched when slid into and out of the bath. I think the greatest thing about this little bumper is the fact that it's absolutely not necessary - no one would miss it, if it wasn't there. But the designers at ChefSteps cared enough to keep the Joule and your water bath container in pristine condition, so they added it. Impressive! In my reviews of the three Anova immersion circulators I highlight the fact that the company designing, manufacturing, and supporting the Anova units has a rich heritage in providing precision temperature control instrumentation to a variety of industries. In my opinion this was an important factor to consider in the purchasing decision of an immersion circulator. ChefSteps also has a rich heritage; albeit much different than Anova's. ChefSteps' focus has been on helping people to cook smarter. They do this because they feel the more people know about cooking the more they will enjoy it. The ChefSteps website is a valuable resource comprised of a plethora of recipes and classes covering a wide variety of cooking types. They have leveraged their expertise in training cooks into an immersion circulator app which takes the novice by the hand and leads them confidently into sous vide cooking. With the Joule they have taken a somewhat natural step to continue to assist the cook by providing the physical tool to assist them in cooking sous vide. The design of the Joule reflects the same passion to help people cook smarter and easier. 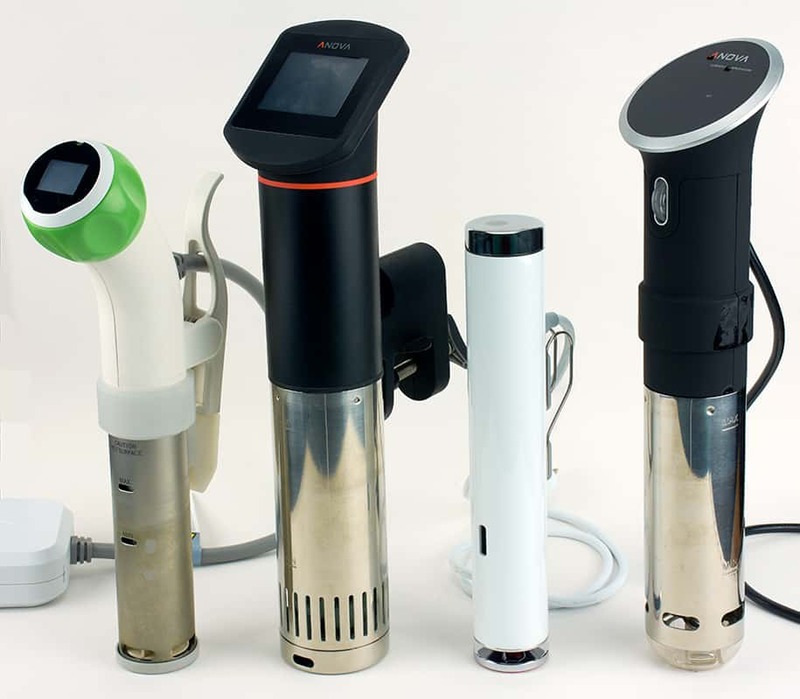 It couples closely with the app to make an extremely attractive solution for those looking to cook sous vide. If you are trying to decide if the ChefSteps Joule is the right immersion circulator for you, the first step you might take is to determine if you need WiFi on your sous vide machine. Because if you don't, there are less expensive immersion circulators that may meet your needs just fine. After reading some of the initial information on the ChefSteps Joule, I have to admit I was really eager to get my hands on one - and I wasn't disappointed! The bottom line is it simply feels, looks, and operates differently than any other immersion circulator I've tested. The fact that the Joule has a WiFi connection to a smartphone currently sets it apart from all other immersion circulators commonly available, except for the Anova Precision Cooker WiFi. But I suspect in another six months WiFi capability will be a common feature on many immersion circulators. When it occurs, purchasers will be making their decisions on the capability of the software provided on either end of that WiFi connection. This is where I believe ChefSteps has an important advantage with the Joule. ChefSteps has been able to leverage their years of experience and expertise in teaching cooking to make their app quite impressive. As mentioned in the review, it still has important monitoring and control features which I believe are missing but when it comes to assisting the novice sous vider in learning how to cook amazing food, it can't be beat. In addition to the quality of the ChefSteps app, they have had the foresight to make it possible to download additional capability into the Joule unit itself. This will allow them to add new features and services to both the immersion circulator and the app, making the cooking system more "intelligent" and user-friendly. I believe the capability for a manufacturer to be able to upgrade both their app and immersion circulator "in the field" should be an important factor in any future WiFi sous vide machine purchasing decision. The biggest difference between the ChefSteps Joule and all other immersion circulators is the fact it requires the user to control it with a smartphone. If you don't have, or intend to obtain, a smartphone in the near future - the Joule is not for you. For those of you who do have a smartphone supported by ChefSteps, you need to decide if this "hands-off" type of monitoring and control is for you. Clearly this important design decision is what allowed ChefSteps to make the Joule so small and "nimble". This reduced size may be an important factor for those who have limited space in their kitchen or would like to take their immersion circulator with them when they travel. Despite its small size the ChefSteps Joule is one of the more powerful immersion circulators available. It is also very efficient and quiet when running. If you are in the market for an immersion circulator with WiFi connectivity, we would recommend the ChefSteps Joule. The immersion circulator, and its impressive associated app, are great tools for getting even the most novice cook into the enjoyment of sous vide cooking. I hope this review of the ChefSteps Joule has provided you with the information you need to make a well-informed purchasing decision regarding a sous vide immersion circulator. I encourage you to explore the site for reviews of other sous vide machines. If you do purchase an immersion circulator you may be interested in looking at our reviews of Sous Vide Water Bath Containers. If you have experience with the ChefSteps Joule, I would appreciate you sharing it in the comments below. Thanks.